It’s that time again! Recipe ReDux kicks off the New Year with a fresh start. Nothing helps to start the day off right than a filling breakfast. I don’t know about you, but I usually have very little time in the morning to actually sit down for breakfast. Sure, I could get up earlier, but most of the time I eat breakfast at my desk or in the car on the way to the office from the gym. It’s not perfect but that’s just where breakfast falls in my life. I love nothing more than lazy sundays complete with scrambles, pancakes, and fruit- but that’s not happening on a weekday. I’ve loved oatmeal for as long as I can remember. 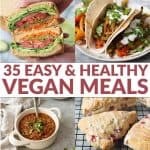 In high school, trying to get creative with meat-free sandwiches, I would make oatmeal ones. Oatmeal bread, jam, and a sprinkling of raisins and rolled oats. Weird, but true. Once I graduated to college, I started making this to take with me to those early 8AM classes. 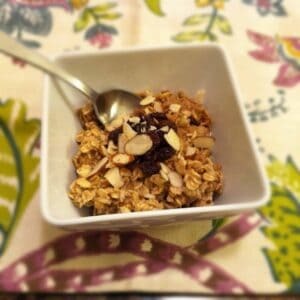 Try this recipe as an alternative to instant oatmeal packets and cereal. With only 1 tsp. 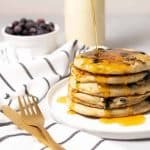 of sugar per serving and full of whole grains, it rivals as a ready-prepared, flavorful breakfast. Prepare all the ingredients the night before and breakfast prep takes no time at all. I usually eat this cold but feel free to heat it up if you like your oatmeal warm. 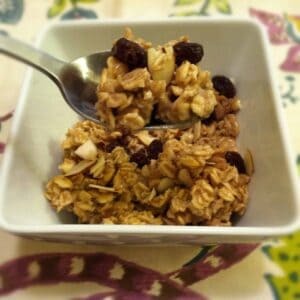 Combine all ingredients from rolled oats to vanilla extract in a bowl and stir to combine. Cover and place into the refrigerator overnight or for at least 6 hours. When ready to serve, stir in agave nectar. If you prefer your oatmeal warm, zap it in the microwave or heat it on the stove for 2 minutes. I actually prefer this cold! Top with raisins and almonds. Please check out my other re-duxers to see their breakfast creations. What’s your favorite weeknight breakfast? i love soaked oats… and all of your chai spices sound fantastic. thanks for sharing! Thanks for the comments, so glad you like it! LOve, love these combo of spices!!! I’m making this week for my kids, they love spicy starts to the day! chia makes everything better doesn’t it?? great recipe! Aha another chai lover, great minds think alike! love the use of almond milk too. Looks delicious! I make something similar, them heat up the oat blend with milk and have warm cereal with “chai tea”. I’ll have to try your version and soak the oats over night. Yum! From one oat-lover to another, this looks great! A nice spicy twist on the usual routine.